Starmobile has recently released a full line-up of new Android smartphones and tablets. The lineup includes Starmobile Navi, Like, Engage 8, Engage 7; but the phones that caught my attention are the Starmobile Muse and Starmobile Diamond S1, Diamond S2 and Diamond D3. In this article let’s check out the Starmobile Muse first. 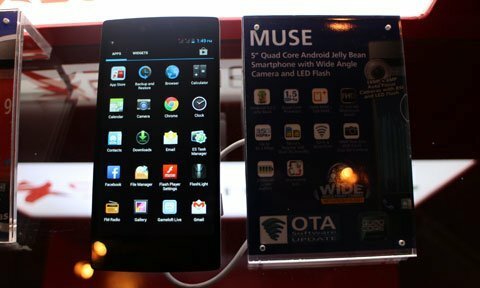 The Starmobile Muse is the company’s latest flagship Android smartphone featuring a 5-inch capacitive Full HD touch display at 1920×1080 resolution, with 441 pixels per inch density. I’m not really sure if this is an IPS display, but most probably it is (I hope so). It has slim body and its body is made out of polycarbonate material. For photo-savvy users, the Muse has an 18-megapixel rear facing BSI AF camera with LED flash, paired with an 8 megapixel front facing camera perfect for doing selfie photos. Under the hood of the Starmobile Muse is a MediaTek quad core processor clocked at 1.5GHz with 1GB of RAM. There is a 16GB of internal memory, sadly it doesn’t have a micro SD slot. It runs on Android 4.2.2 Jelly Bean out of the box and comes with a non-removable 2,300 mAh Li-Ion Battery. Detailed specs indicated below. The Starmobile Muse has a suggested retail price of Php 12,990 and will be available in Starmobile kiosks nationwide starting December. The Muse looks and sounds good, but it’s not a perfect gadget. I mean, there’s no microSD card slot, which I think is a must in every Android device; and it comes with only 1GB of RAM and battery capacity is not that high. The only thing that the Starmobile Muse can brag about is its 5-inch full HD display and the 18 and 8 megapixel front and rear camera. But we are not sure how good will these cameras perform yet. Megapixels is not the measurement of the quality of the photos taken, it just refers to the size, and not the quality.